Oscillatory Thoughts: My Scientific American post: "What bats, bombs, and sharks taught us about hearing"
My Scientific American post: "What bats, bombs, and sharks taught us about hearing"
A few weeks ago I was asked by the man himself, Bora Zivkovic of the Scientific American blog, if I wanted to write a guest post. There was one I'd been wanting to write for a while but hadn't gotten around to because of the amount of work that it would require. Well I finally got around to it, and it's posted over on SciAm. It's the most proper "news article-like" thing I've written. 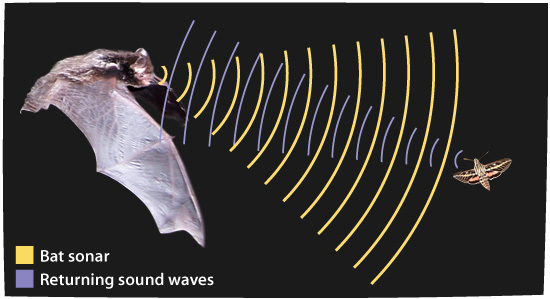 The post is about my great-grand advisor, Robert Galambos, the man who discovered, among several other cool things, that bats use echolocation to navigate. I had to edit out a few pieces of the video from the original Galambos version, but I honestly didn't cut anything critical. I left in all of his narration. The only parts I cut were the repetitions showing the bats flying normally, bats flying awkwardly, etc. He had several extra minutes of these segments to help demonstrate his point. As for my article, I'd appreciate it if you all would read the whole thing, mainly because I'd love to get your feedback and thoughts on it! What impressed me the most about Galambos though wasn't his superb research, but rather the extent to which he'd sacrifice himself for his pursuit of knowledge. 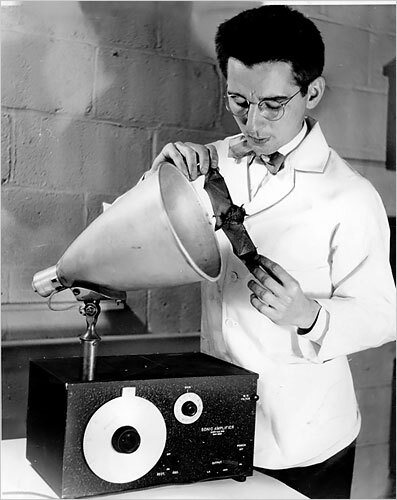 In another experiment, conducted in response to the bombing of Pearl Harbor in 1942, Galambos and hearing researcher Hallowell "Hal" Davis were asked to "find out how much and what kind of sound it takes to injure or incapacitate a man." we proceeded to expose our ears to the sound waves emitted by a so-called bullhorn, the kind of loudspeaker the Navy used to deliver messages to personnel wearing earplugs on the busy flight deck of an aircraft carrier. We systematically varied the three sound variables--intensity, frequency, and duration--producing in ourselves increasingly larger temporary hearing losses, until we neared combinations we thought might cause a permanent loss. At the end of the project, Hal decided to find out if our predictions were correct, and told us to expose his right ear--we always protected his left ear--to a wideband noise at 130 dB for 32 minutes. As predicted, this exposure permanently sliced a few hundred Hz off the high end of his existing congenital hearing loss in the 3500-3800 Hz region. I'm excited about this piece, but it was a lot of work, so I don't think I'll be writing these kinds of pieces often. I've got too much science to do! Perhaps Galambos doesn’t look at his acts of adventurousness as mistakes. Nice post! Thanks. I certainly don't look on them as mistakes, either. But I would imagine such methods would not be advocated by many advisors! Good job with the article. I still remember Bob Galambos' talk when he visited Berkeley & I was glad to briefly meet him. One small note on the article is that ABR tests in newborns are less common than I thought. For my first kid, the hospital offered it as a $100 option & it wasn't covered by insurance. For my second kid, they first tested optoacoustic emissions, which doesn't used EEG. I talked with the audiologist a bit & she said that OAE is much cheaper technology & was the standard for their first attempts, but doesn't work as well in certain situations. Since it wasn't working on my kid, I convinced her to come back with the ABR system. I wasn't leaving the hospital without a picture of a newborn with EEG leads! ABR is very common, but, since it isn't always covered by insurance & OAE is also available, it's not quite pervasive to say most people born in the last 30 years had the test. Dah: Fascinating! Bob told me the ABR was a ubiquitous test, but it's interesting to hear that the OAE test is also being heavily used. Was your child born at AB? I remember hearing the same thing about ABR & was surprised to find out it wasn't quite true. First child at AB. That's where they only offered ABR, but it was optional & we had to pay out of pocket. Second was in D.C. where they first tried the OAE test. In the sense that every hospital in the nation probably has the hardware to test ABR, it is definitely ubiquitous, but it's not used on everyone.